When we talk of our ‘networks’, we often perceive them to exist virtually, within our own minds or in a space where the countless connections cannot be illustrated or the potential experienced. Before LinkedIn or Shapr helped record, contain and develop networks, who we knew and what they did likely just existed in our minds and we relied on our brains to make valuable introductions and consider potential collaborations. This first degree of connection has it’s limitations, mainly relating to our own grey matter’s ability to step up to this task. All businesses and organizations, especially in their infancy, are reliant for growth upon an entrepreneur having a network and them making requests of that network. These requests can be for additional connections, to engage in business, or both. This second degree of connection is time consuming and to deliver the successes objectified, entrepreneurs will make many meeting and requests. Jason Boudreau, VELA Wealth’s Founder has disciplined himself and his team to rigorously engage in activities related to network development and maintenance since he founded VELA Wealth. These activities and net-weaving (purposefully and proactively connecting those in one’s network who are not yet connected) are largely responsible for VELA Wealth’s growth and community. In 2016, VELA Wealth created GRAVITY, an annual event with the purpose of bringing together VELA’s network. This third degree of connection was conceived as a result of Jason’s desire to capture the essence of VELA Wealth’s ecosystem, to acknowledge those within it and to create environments where the people who contributed to the journey could experience the power of the network and their efforts to support and grow it. 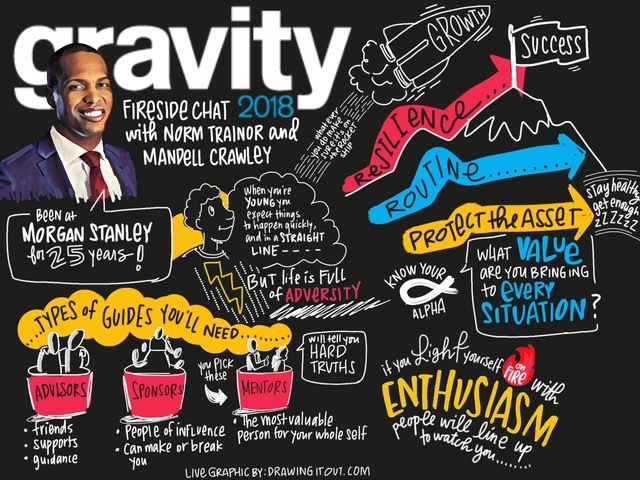 GRAVITY 2018 exceeded the mandate. The carefully curated content and mediums to drive connection delivered an inspired, confident and creative energy. VELA Wealth had grounded it’s network and delivered an exciting space and experience for it to be alive and thrive. Many new ideas and declarations were born, jobs offered and journeys started. GRAVITY 2018 was uniquely recorded in real time by a highly talented illustrator. 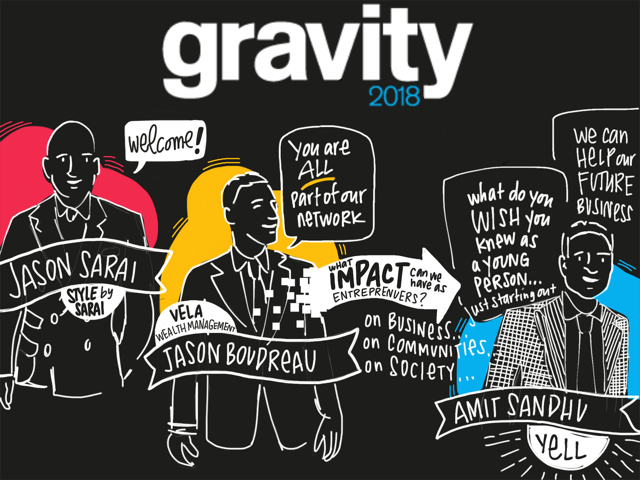 It is a privilege to share GRAVITY 2018 and it’s achievements with you, and we look forward to taking GRAVITY to new levels in 2019. What does your network mean to your ecosystem and how can you ground yours?